Women know what's right or wrong. The Samaritan woman was the 1st missionary. Jesus poured his love into her even though she was the one everyone whispered about. He released her from the pain of shame. She expected condemnation. Jesus really saw her. He assured her she was significant. Grace mercy salvation. We all need it. What are we afraid of? Are we stuck in the iceberg syndrome? 90% under water? Do we try to hide in drugs? Ikta? I know this already? 1. Hurt. Brought on by you or others. Happy are you if you are spiritually poor. God can fix you. 2. Hangups. Fading dreams. Let God renew you. 3. Habits. Hurts and hang ups become your normal. Being robbed of hope. Communion. For those who understand what Jesus did for us. If you are coming with all kinds of hurts hangups and habits God can give you hope. If this is your 1st understanding of communion, please come up and pray for new life. Come now and partake. Jesus took bread broke it and gave it to his disciples. "Do this in remembrance of me." Bless the Lord oh my soul worship his holy name. The church was filled by 1 and the other big church served as an overflow. She bounced into heaven and lit up the place with her beaming smile and twinkle in her eyes. Stefan (nephew) liked his aunt so very much. She told him he was her favorite. He will sing for her. Don't let her death separate you from God. We will sing now. 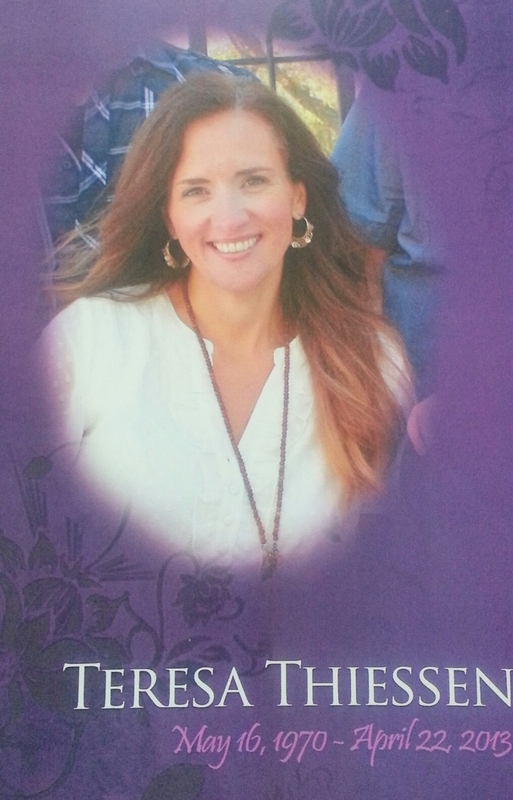 Aunt Teresa and a million angels will be joining us. Songs: My savior lives. He died to be my savior. Our God is greater awesome in power. If our God is with us who can stand against us? Amazing grace how sweet the sound! My chains are gone I've been set free! My God my savior has ransomed me. All is well with my soul he is God in control. I know not all his plans but I know I'm in his hands. Teresa was 42. She died Monday of a heart attack just like her dad and other cousins. Teresa is organizing a big party in heaven for her family. Tribute to mom: Payton: mom was so wonderful. Mom called me her twin and rebel child. Mom borrowed my clothes and I borrowed hers. Tribute by Anthony: Loneliness. Fly to the Angels, song by Slaughter. Handwritten tribute not readable on the screen. Wish someone would read his tribute and cut out the awful noise. We interviewed her brother Eric at one point. Recurring theme. Enthusiasm, energy. How can empty cliches comfort me? She did so many things. 200th EMC conference she knew when to say no. She did everything with enthusiasm. She did children's interviews and she knew exactly how to things whole heartedly. She always got things done. Organized spontaneous almost perfect, she served God. She was a follower of Jesus. She proved it was fun to trust Jesus. Teresa knew she had a genetic heart defect. But she served Jesus with her whole heart. Jesus conquered death. He gifts us with his righteousness. That would bring her into God's presence in heaven. Teresa had her name written in the Lamb's Book of Life. She heard the words of welcome this Monday when she arrived at the heavenly gates. Her reservation had been made. Song: When I Get Where I'm Going the first thing I'm doing is to spread my wings and fly. Don't cry for me down here. There will be only happy tears. I'll stand forever in the light of my amazing makers face. Uncle Peter was different and eccentric. A remarkable man. Uncle Pete arranged for aunt Esther's visits to Manitoba. He cared for her after she had a stroke. Nephew John arranged for her siblings to visit. He was a good story teller. He loved to exaggerate his stories. At age 6 he drove the horses 20 miles with a load of grain and sold the grain and deposited the cheque before driving home. At age 8 he started school read the book backwards and forwards. He chased a rattlesnake and almost got bitten but knew not to chase rattlers again. He was a renaissance man and could build good buildings. He was beggar poor and could not afford university. But he made sure his kids could attend university. He remembered stories and told them 90 years later. When Eugene passed away 2 years ago he had a hard time with that. Children are not supposed to die before their parents. Uncle Pete is now safe at home. Iris cared for him with love and care. He is resting under God's wings now. Ed Reimer: Thanks for the invitation to share. 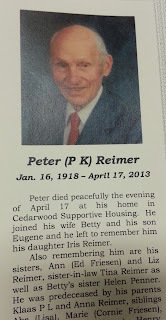 Pete was a wonderful man. Never negative. He married my favorite aunt. Dug a trench once when it caved in on Ed. Ed ended up going back to school and eventually earned his doctorate. 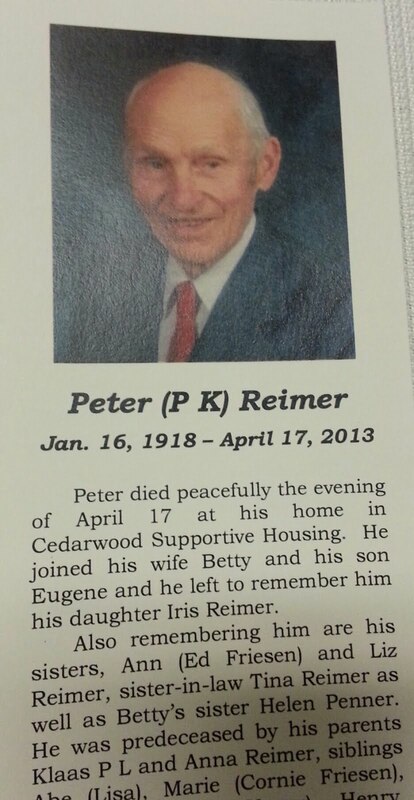 Worked with uncle Peter one summer. Was a lot of fun. He was a very supportive person. Worked into his 70's. Walked miles all over town well into his 90's. We will be there for each other as we grow old and frail. What a day that will be when my Jesus I shall see! Loved uncle Pete. Learned lots of lessons from him. The most important was forgiveness. Luke 15: The prodigal sons. The younger brother was selfish and squandered his money. When hard times hit he ran out of $20s and friends. Back on the farm they have a calf in the fattening pen. Father waits for the youngest son to come home so they can kill the fattened calf. He waits. When the son shows up he forgives him immediately and puts on a big party. The older brother is too selfish to appreciate the party. How Beautiful Heaven must be. Sweet home of the happy and free. Greg Waglund and Anna are moving to Calgary to work at the Mustard Seed. Rogalski family went to Nicaragua to work with Schoolbox building schools there just outside of Leon. Most children only get to grade five. The volunteers prayed for unity. They found God created a positive attitude. We pray for our leaders to be kind and merciful to the least among us. The FIRST PETER PROJECT to memorize the entire book. "Memorization of Scripture," Dallas Willard writes, "is one way of 'taking charge' of the contents of our conscious thoughts, and of the feelings, beliefs, and actions that depend on them." Christians were like hopeful aliens. Peter talked about change though spiritual nourishment. Internet has miles of Christian resources. Questions. What do you crave? What are you trusting? We have a story about Peter that might help us understand his book. He has great gifts and we can learn from him even though he didn't always get things right. At one point he rebuked Jesus and at other times he says the right things but gets things wrong. In his book he maybe showed he had learned a thing or two. Open your eyes and ears. CRAVE the WORD. Go deep with God. God chooses to call his followers friends. Rid yourselves of malice the desire to harm people. Deceptive actions and words. Grow into your salvation. Christians expect slander. The scriptures are sweeter than honey. There are all kinds of resources that help Christians grow. Ancient meditations are coming back. Seeking The Face of God. A book you should read. Memorization of Scripture is a wonderful way to open up hearts to the will of God. The more you memorize the more you'll want to. Kate is an artist. She painted herself with a milk mustache. Grow. The church can't be concerned about growth unless it is concerned about personal growth. The love language of Jesus and forgiveness. When you dig into the Word you will understand how deeply you are loved. As you dig into the Word you'll start to pray more deeply. Dawn of the Dead pushed the Passion out of first place. People talk back to the screen. Scary movies are predicated on people doing stupid things. Viewers talk back to the screen. This is an experience we all relate to. We watch the movies of our lives and we say I should not be doing that. We say we should not be so stupid but do it anyway. We are glorious and gory. There is sin in us. How do we respond to the word. What if we call it goosblab. Does that make it better? Paul said I do the stupid stuff? Which one is the real Paul? The stupid one or the other one? Genesis we learned we are made to relate reveal reproduce rule. Like God we are created to live as us. Genesis 3 the serpent was crafty. Satan or the devil was there. Is God really that bad? The tree was a place of choice. Love live or evil. Adam could have said to God your evil snake is talking. Snake and Eve were talking like God wasn't there. There was no evil in the garden. Eve didn't know what evil was. Good for food, attractive, and good for gaining wisdom. So she ate it. And gave some to her husband. He was the quintessential couch potato. They realized they were naked. They covered up their private parts because they were ashamed. People bring shame on themselves. They are now trying to hide from God. We can't hide from God. When did nakedness become a category? Did you eat from the tree? The woman YOU made is to blame, he said. Eve says it's the serpent's fault. When Adam sinned, sin entered the world. Restraint is not wrong. Freedom happens when we do the right things. The goldfish restrained in the bowl is happier there than on the floor. You can't hide from God. Repressed emotions don't heal. Forgiveness will be the way forward. Every relationship must be bathed in forgiveness. Start by receiving God's forgiveness. We have an internal serpent. Garden snake meant God gave them a real choice. Foreknowledge is not fore-causation. My wife will kiss me. I know that but I am not causing her to do it. Why is the kingdom better than the garden? You know when you have kids they will get hurt. There is something better than the pain. God said that the woman's descendant will crush Satan and Satan will bite Adam 2.0 (Jesus) for a restart. YouVersion app Live search the meeting house. Never heard the Bible that way before. What does it look like to live in the post Easter season? My friend is nobody children's song. Catchy tune was ok for kids but not for adults. I'm friends with Jesus. You can't see him. Are you ok? Jesus told me to do this? Leave my spouse? He would never say that. There is danger in using Jesus an excuse for doing "what I want to do"! Jesus said I call you friends because I have shared with you what God told me. How has Jesus made things known to us? The Holy Spirit, God makes himself known to us. Our invisible friend. God is made real and present. Haggai says I am with you. Courage. Evil goes away. Strength. Ps 51 create a new spirit within me. Cleansing. Forgiving. Guarantee. Assurance. Joel has the promise of renewal. The power behind the work of God. The Spirit is at work. The Trinity. God has 3 parts. All moving in the same direction in perfect unity. They can't be separated. Luke 4 the Spirit is on Jesus. A life lived in the Spirit. What is it? 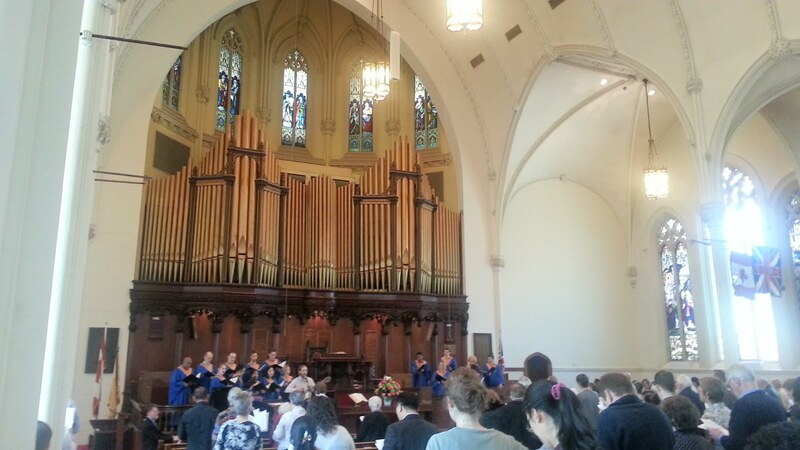 Clapping, dancing while worshipping? Slain in the spirit loss of control? We are big on control so we have difficulty with those wild visions. The Spirit is the will to live God's way. I want to be more loving and gracious. God's Spirit gives us the mind of Christ. And the power. Life can be so exhausting trying to do the right things. The Spirit gives us the power for Jesus' life to shine through us. That means we have to let go of our will. A little less of my will and a little more of God's will every day. Letting go a little bit more every day. Lots of people have said that the evil they do is from the Spirit of God. Life in the Spirit will give you a life that looks like Jesus. Focus on Christ Jesus every day. Read books and the Bible that make us more like Jesus. For God was in Christ, reconciling the world to himself, no longer counting people's sins against them. And he gave us this wonderful message of reconciliation. So we are Christ's ambassadors; God is making his appeal through us. We speak for Christ when we plead, "Come back to God!" If the 12 year old said I'm getting ready to clean my room and spends all her time translating the phrase and planning procedures but does not actually clean her room her father is not going to be impressed. God has asked us to connect people to God. Are we studying how or are we doing it? Is it enough to show love? Is it enough to teach Sunday school? Do we think we need more blood in our organization? More plans? God's Holy Spirit will help us connect people to God wherever we are. When our eyes close everything we have will belong to someone else. Unless we fix our eyes on the eternal and connect people to God it will pass away. Take the 10 most wanted list and fill it with people God has laid on your heart and pray for them and God will make you a co-laborer with Him. When your eyes close in death make sure your grandchildren know you were committed to faithful service to Christ. Train others to train others for outreach. Mentor someone for Jesus. The church is most effective outside the church. "Go and make disciples" Jesus said. Not come to church. Christians need to be discipled. They need a close relationship with Christ. Leadership is needed in all our churches. A group meets Fridays 7 a.m. at Perkins Henderson.